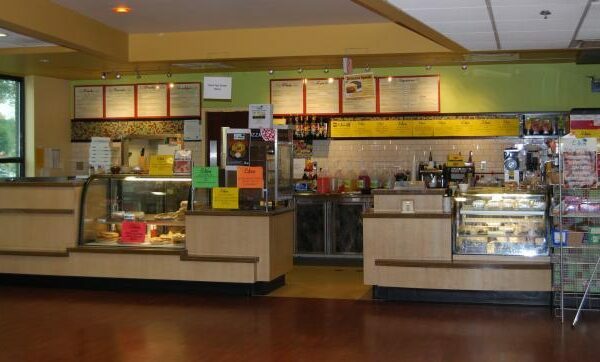 All food in the café is dairy or veggie. Breakfast features gourmet coffee, eggs, omelettes and bagels with an assortment of spreads. 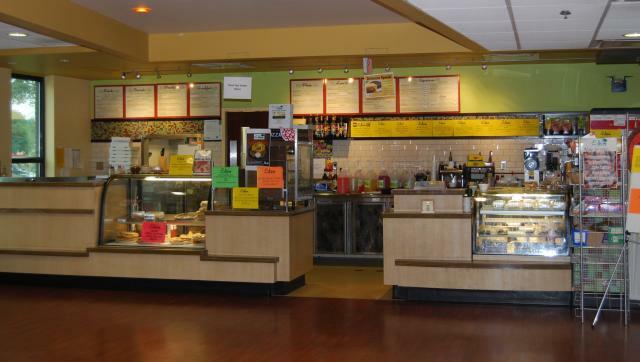 Lunch and dinner choices include: falafel, pastas, soups, salads, calzones, wraps, paninis, knishes, fish, pretzels with toppings and a great variety of pizzas. Teens rave about the French fries. Desserts include soft and hard ice cream, sundaes, milkshakes, cheesecake and ice cream cake (by special order). Visitors will also find many kosher packaged goods from Israel, including lots of yummy Mediterranean treats. The café is bathed in bright light from the glass atrium seating area and is decorated in shades of green, yellow and burgundy with natural wood grain accents. There is ample seating and decorative partitions allow the atrium to be privatized for your catered celebration. The Eden Cafe is under the Kashrut supervision of the Star-K and all items are Yoshon, Pas Yisroel, and Cholov Yisroel.